Some of you may remember that on November 25th I wrote a short piece publicizing the idea of establishing parish based men’s groups that are part of the Holy League. The idea is that the men’s Holy League meets monthly and has been formed in response to a call from Cardinal Burke, to create a network of parish-based men’s groups in a structured Holy Hour. 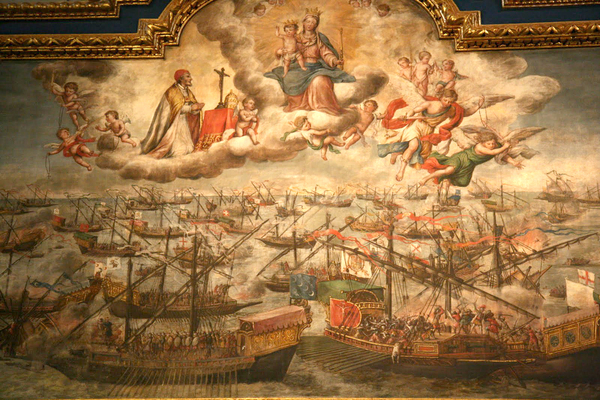 The Holy League was first formed as part of the call to holiness and fortitude that occurred when Europe was under threat from Islamic forces, before the battle of Lepanto in 1571. The aim is to reestablish this in every Catholic parish. The intention is that it will form men to be engaged in spiritual combat and to participate in the transformation of the culture, just as it did in the 16th century. I would love to hear of any groups that have started and how they are doing. I would be happy to publicize your Holy League meeting. The one I mentioned in my original blog post, in Manchester, New Hampshire, is still going strong; it is due to meet at St Raphael’s Church in Manchester this coming Friday at 7pm. The format is: Compline, Eucharistic Adoration, prayer, short spiritual reflections, the availability of the Sacrament of Confession, Benediction and fraternity. Following the Holy Hour there is a Social Hour - bring something to drink! The conversation in this crowd of men is always hard hitting, intelligent and fun.